Alaska Highway Week Four is the final week of our Alaska Highway Adventure. And we’re spending it on the waters of the Inside Passage cruising the Alaska Marine Highway from Homer, AK, to Bellingham, WA. 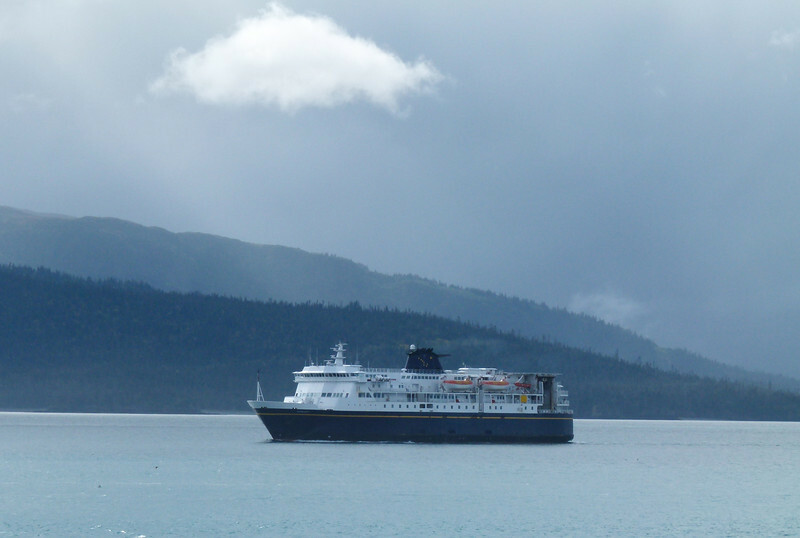 Due to damage at the Whittier loading dock, the original departure location, the M/V Kennicott left from Homer, AK. 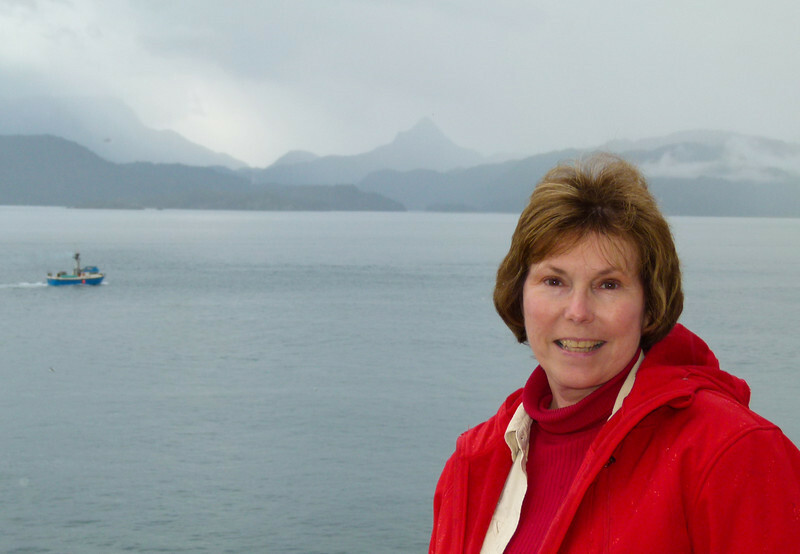 I might be smiling, but this travel princess and cruiser of small luxury ships is really wondering, “Where’s the champagne to toast our departure?” “Where’s the balcony in the cabin?” “Where’s Raju, our butler?” Seriously, I did enjoy the ferry ride down the Inside Passage. 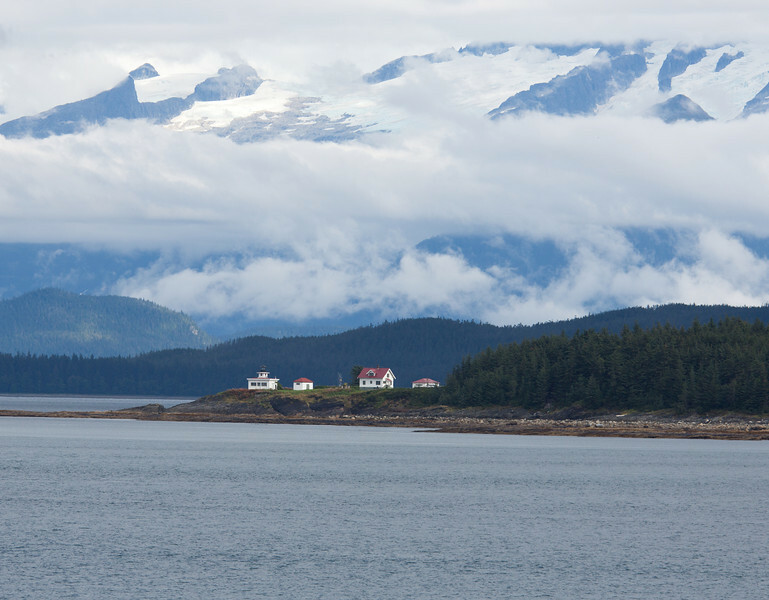 It even taught me to disconnect from the online world—that’s right there is no internet on the Alaska Marine Highway—and relax. 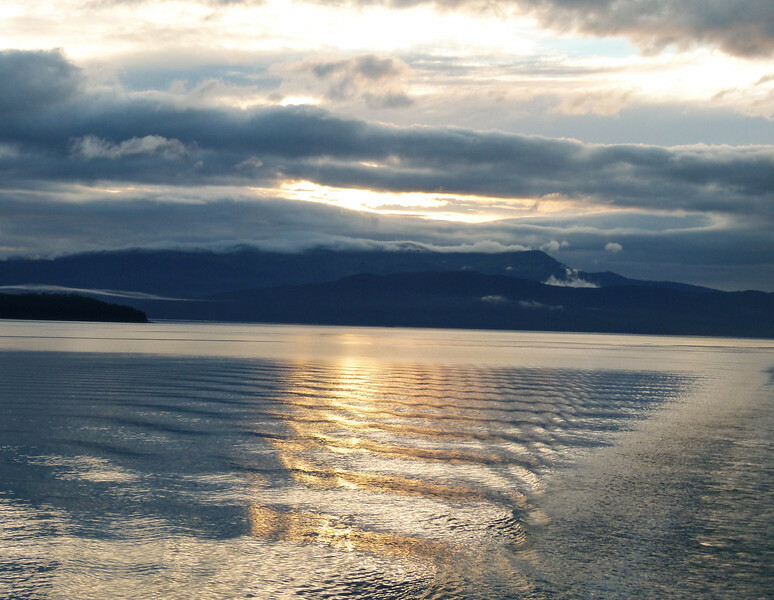 Standing at the rail, ready to cruise the Inside Passage. 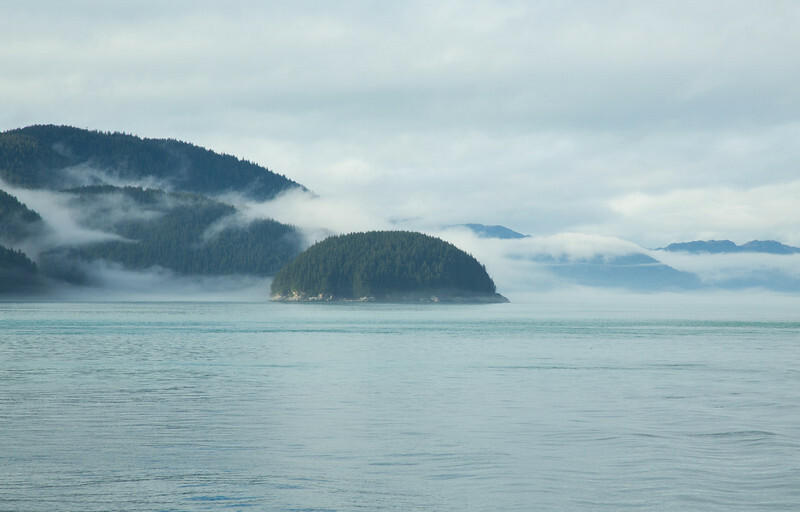 The weather is changeable on the Inside Passage, but that’s part of the fun. Alan had plenty of opportunity to take moody photographs like this one. The sun appeared for the sail into Juneau making it a photographic journey. All the photographers were at the railing when we passed Point Retreat. What a majestic sight! Glaciers and a lighthouse…what a combination! We’ve sailed into Juneau twice but have never witnessed Matanuska Glacier in all her glory. Alan couldn’t take enough photos. The sun came out just in time for this glorious scene. We didn’t have too many opportunities to photograph the sunset, but the weather cooperated on the last day of cruising the Inside Passage. The last two times we’ve visited in Ketchikan it’s been a sunny, cloudless day. 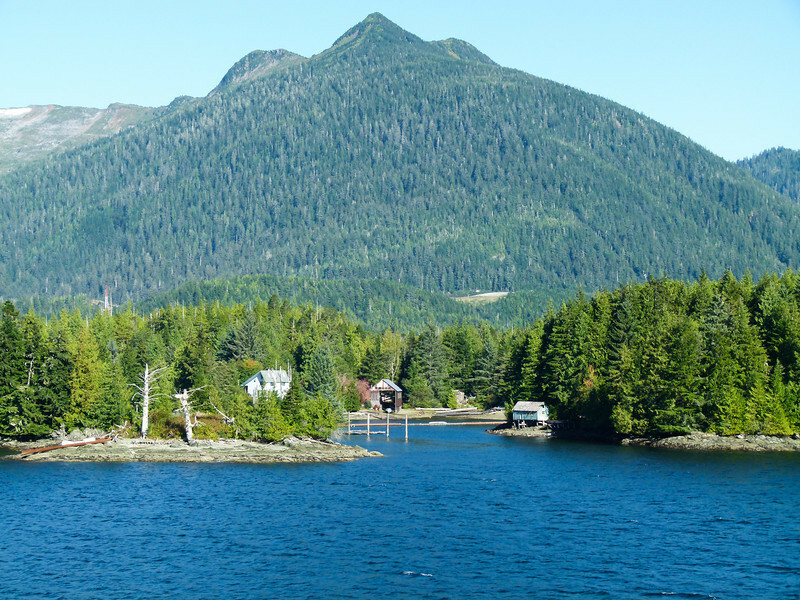 Maybe the citizens would like for us to return more often to this normally rainy destination in Southeast Alaska. I guess you could call this a Ketchikan suburb. This ends our Scenes From the Road: Alaska Highway photo essays. Did you see Alaska Highway Week One, Alaska Highway Week Two and Alaska Highway Week Three? Stay tuned as we begin to write in detail about our trip. Here’s the first article: Driving on Top of the World. 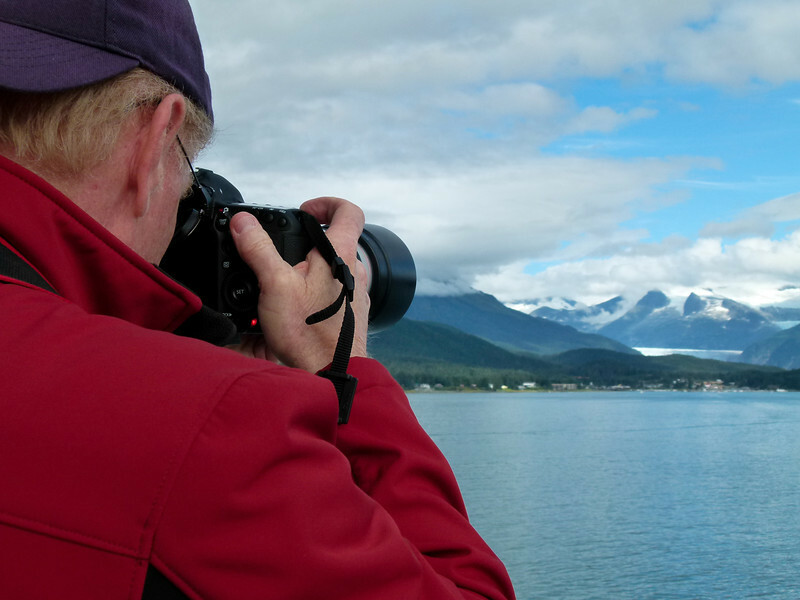 Read the entire collection of Alaska Highway road trip articles to plan your own trip. Boomer adventure guaranteed. Have you enjoyed our scenes from the road? Join the conversation at the My Itchy Travel Feet page on Facebook or send us an email to ask a question or share your experience.